Nothing says Thanksgiving like turkeys and place cards on the table. You will find lots of ideas that are festive but also really simple. These ideas won’t bust the budget or take forever to complete. 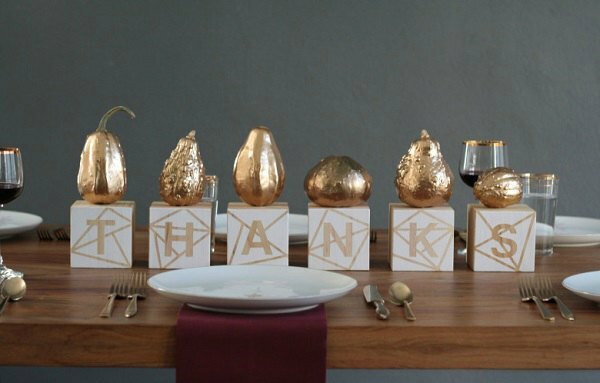 You will love these easy Thanksgiving table decorations. Let the entire family get involved and make a day of it. 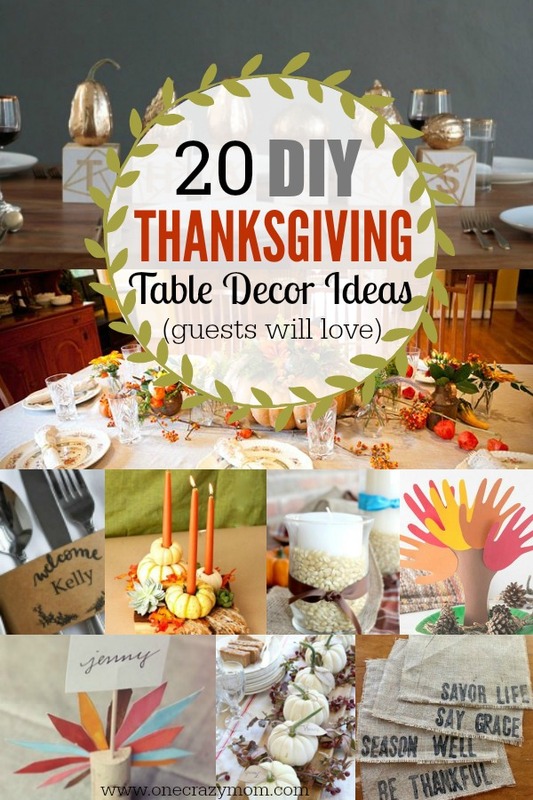 Here are 20 Thanksgiving table decorating ideas. 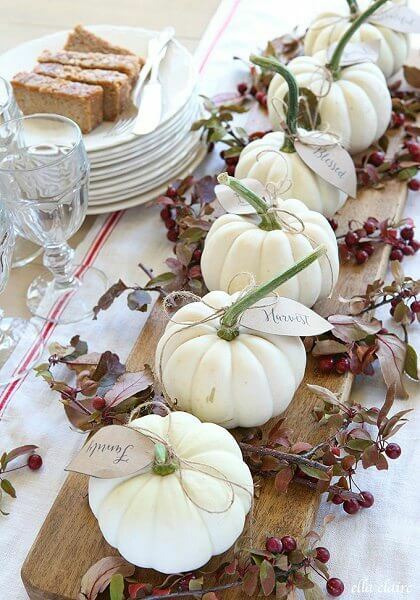 Let’s get started looking at these Easy Thanksgiving table decorations! From the dining room to the kid’s table, we have festive and easy decorations to spruce up your house for Thanksgiving. Make a day of it and get the kids involved! You will love making the memories and your home will look great! Thanksgiving lunch will be special for sure. 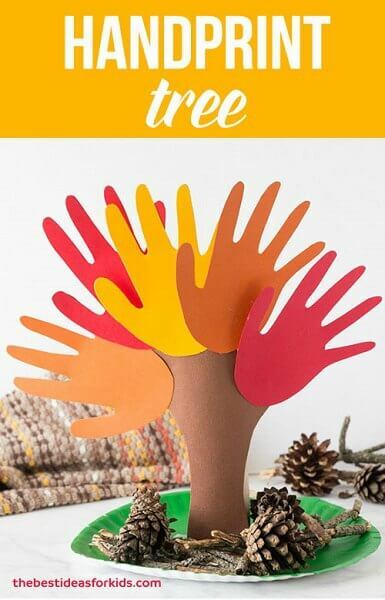 Looking for inexpensive Thanksgiving table decorations? We have tons of ideas that are easy on the budget and take very little time to prepare. These ideas are budget friendly and very simple to make. Even the kids can help make these! The perfect centerpiece for the kid’s table! Let the kids help to make the hand prints extra special. 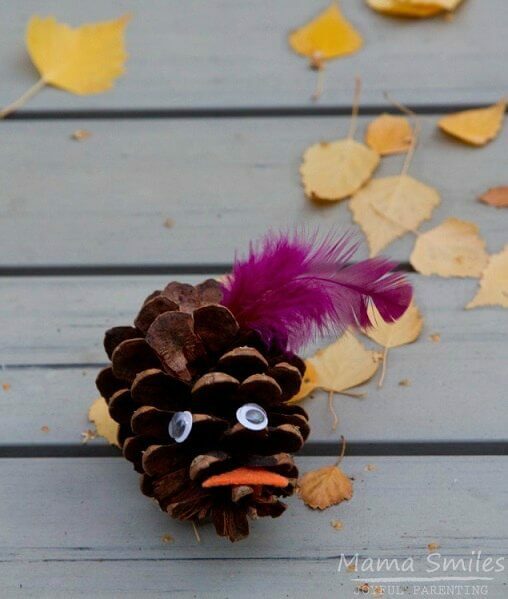 Turn pine cones into cute little turkey’s! Plus, the kids get to have a fun activity by making these. 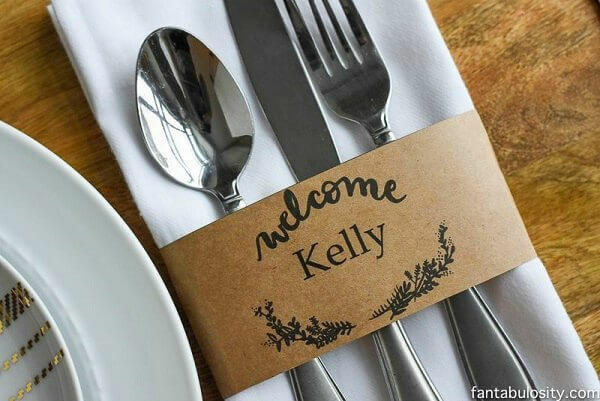 Make these simple but festive place cards for your guests. They will feel so special with these customized cards. Pumpkins and Fall foliage make the perfect centerpiece for Thanksgiving Day. Many of these items you can probably find at home or gather from your yard. I love white pumpkins for something different. The leaves and twine really add a special touch as well and the look is so clean and classic. 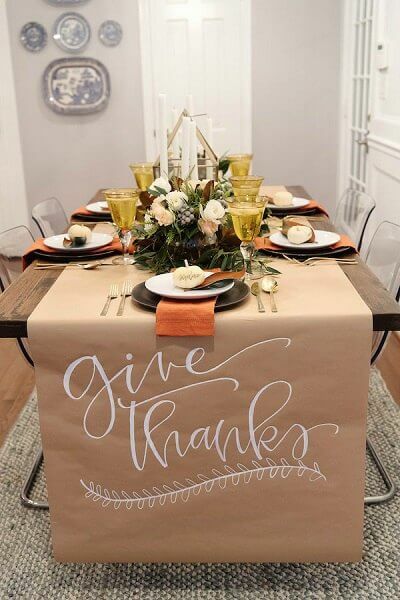 What a cute way to further emphasis gratefulness as everyone comes together to dine on this “give thanks” table runner. So fun and positive. Make this centerpiece for less than $5! 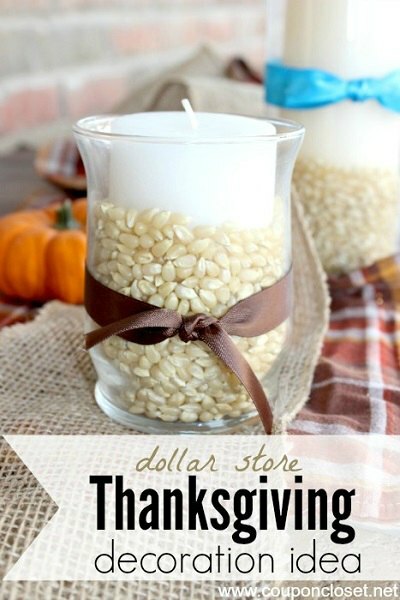 You can get everything you need from the Dollar Tree and it’s such a beautiful centerpiece idea. Use mod podge to mold leaves onto mason jars! The results are stunning once you add a tea light candle and sure to leave a lasting impression. Use these printables to encourage guests to write down what they are thankful for. Love this idea for Thanksgiving dinner. Use pumpkins as centerpieces and a little spray paint too! 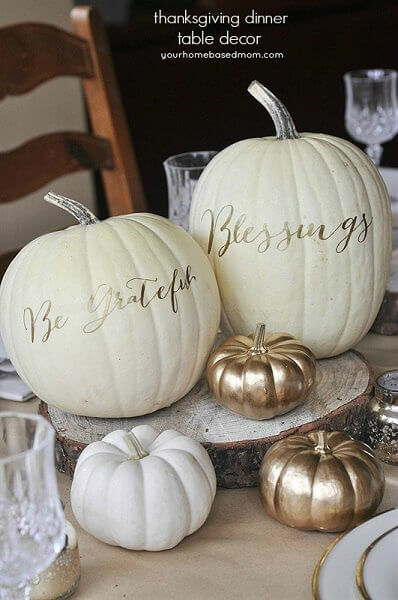 Add words such as “thankful” and “blessings” to really make these pumpkins stand out. 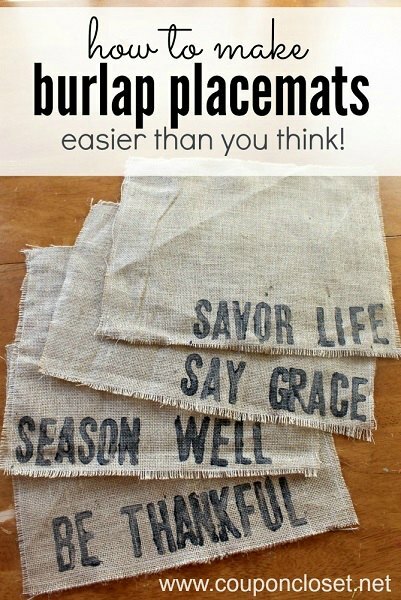 Make your own placemats with burlap. They are really gorgeous with these hand stamped quotes and words such as “savor life”, “be thankful” and more! 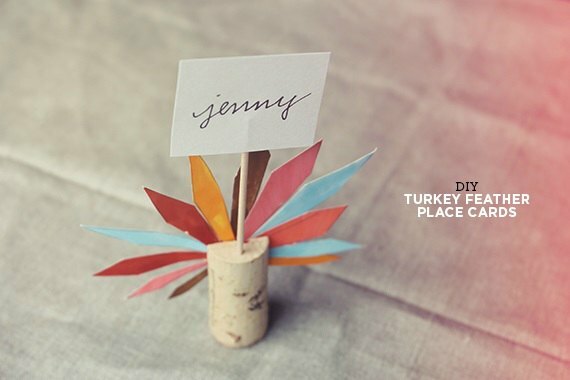 Make place cards and holders out of simple items and DIY feathers. The finished product is so cute! Martha always knows how to make simple items stunning. Love the simple white and pastel colors to make this table pop! White and gold make a very chic Thanksgiving table. It’s layered with a burlap table runner for a really fabulous look. No need to buy expensive table runners. 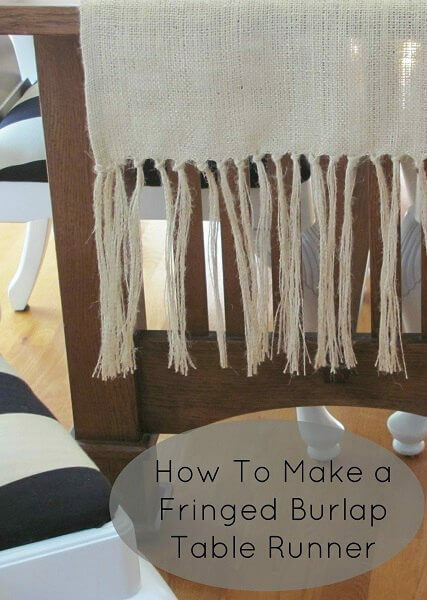 Learn how to make your own fringed one here for much less. Make this faux gourd container for a lovely floral centerpiece. This is beautiful! Who says table runners need to be fabric? Make a wooden one for a creative and rustic look. 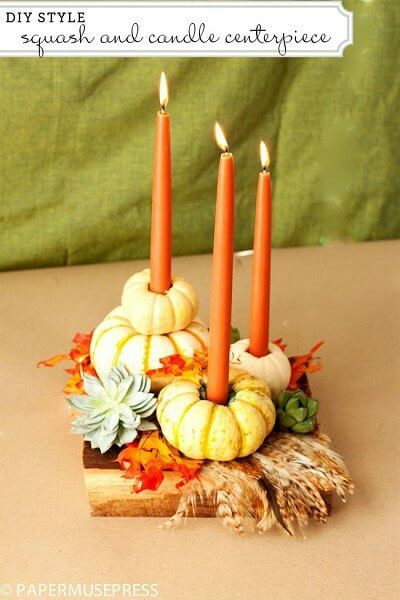 Squash, pumpkins and gourds make the most gorgeous candle holders! This idea is so fun and will make for a gorgeous table. Wooden blocks are so popular right now. Turn them into the perfect centerpiece and top with golden gourds and pumpkins for a little something extra. 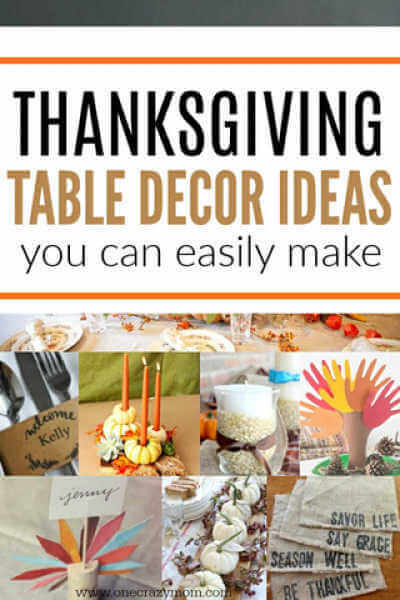 Let us know which of these Thanksgiving table decoration ideas you try. I just love Fall and all the pretty decorations. It’s going to be hard to narrow it down to only one idea. This time of year is just full of pretty things to decorate. I love that you can use items from nature in your yard for a really festive touch. You can also shop your home for items to re-purpose and turn into lovely decorations. 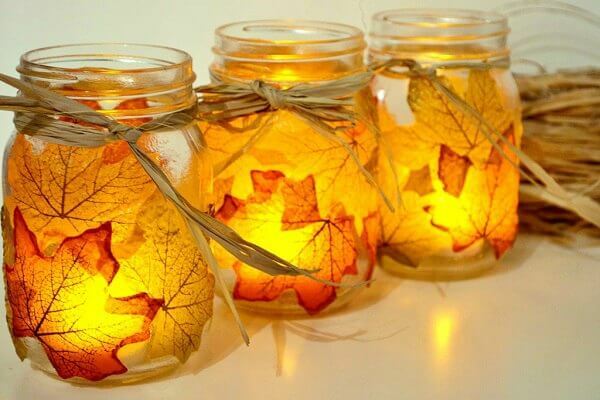 We also have 25 DIY Fall decorating ideas you will love. These ideas are simple to make and won’t break the bank. 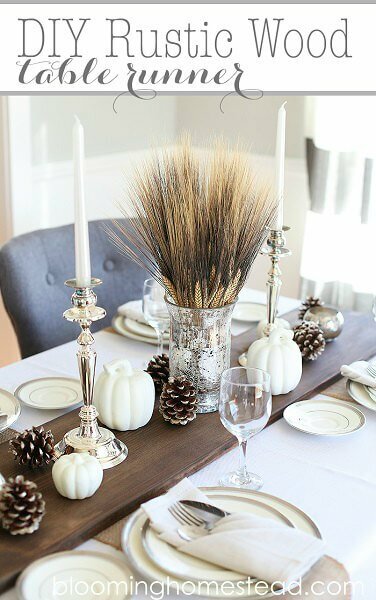 These simple Thanksgiving table decorations are going to look stunning! 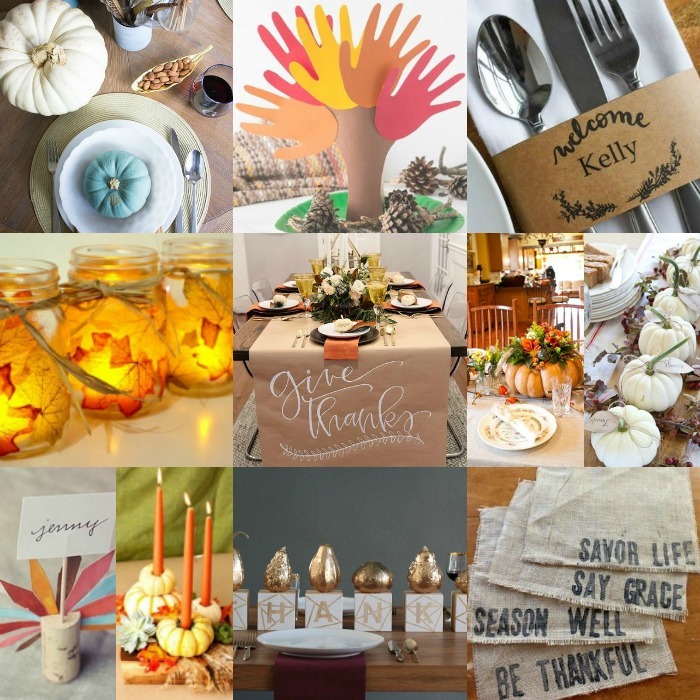 No need to look any further for Thanksgiving table decorations pinterest ideas when you have so many to choose from here! I know your table is going to look stunning. 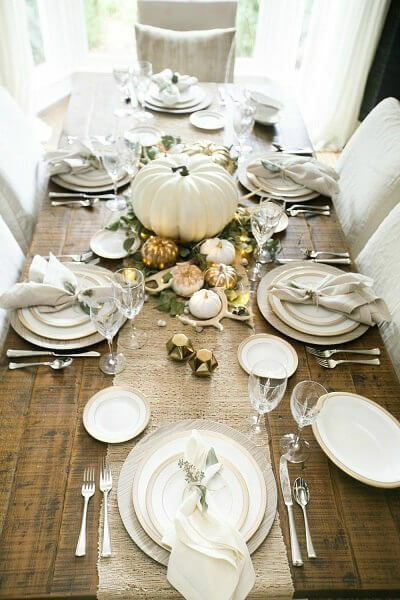 These Thanksgiving tablescape ideas are sure to be a hit and make Thanksgiving dinner amazing. 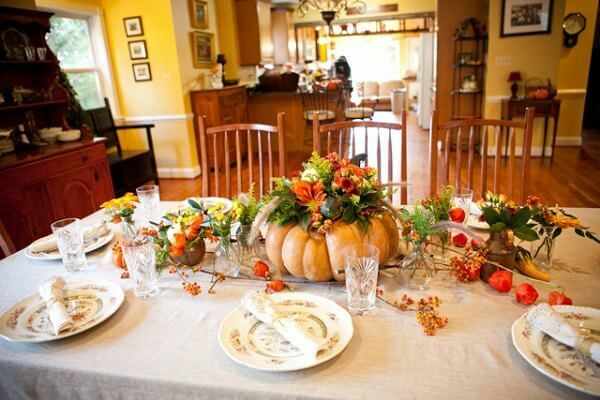 There are several fall table ideas I plan to use to make Thanksgiving dinner special. I love all the simple and easy ideas for fall centerpieces! All of the pretty fall colors look so nice on the dining table and dinner time is so festive now. From rustic table runners and fall flowers, you will be set for Thanksgiving. 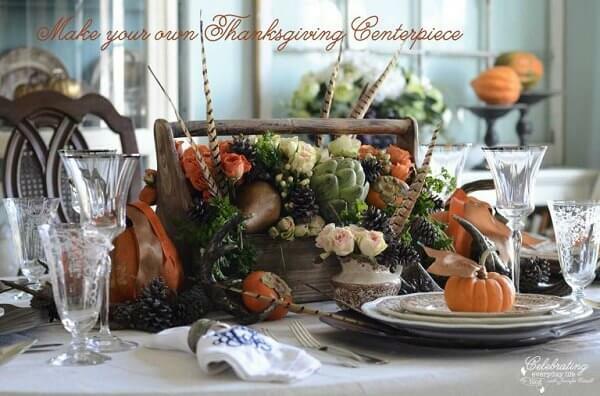 Get started trying these Thanksgiving table centerpieces. 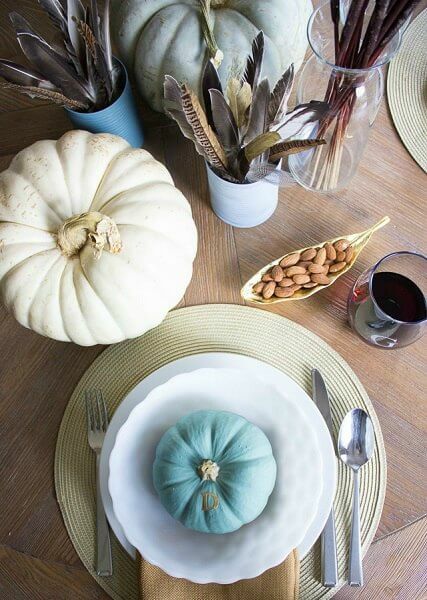 From napkin rings and mini pumpkins and more, these Thanksgiving table decor ideas will be perfect for your dining table. Once your dinner table is complete with these table decor ideas and the table set, it will all come together! If you are looking for recipe ideas for Thanksgiving, try one of these 100 Easy Pumpkin Recipes to try. From pumpkin pie to pumpkin muffins and cake and more, there are tons of delicious new recipes to try.